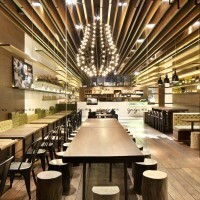 COORDINATION ASIA have designed the GAGA restaurant in Shenzhen, China. 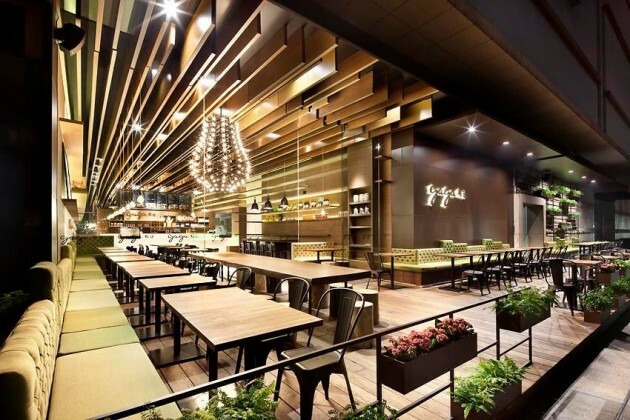 With a growing number of young socialites and creative professionals in China, coffee culture is growing in popularity and café chains are popping up on every corner. Within this highly competitive industry, Gaga is a young, fresh, modern and fashion forward brand that distinguishes itself with a great eye for detail. 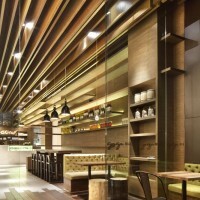 In creating a new design for the deli and eatery in Shenzhen, COORDINATION ASIA took the essence of what has made Gaga a success, and created a one-of-a-kind space that blurs the boundaries between the indoor and the outdoor. The new space that was created for Gaga uses the existing color scheme of the brand. The atmosphere is warm, natural and cozy. 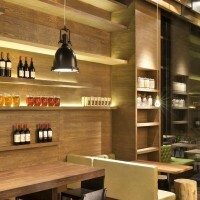 Rustic wood, soft organic textile and green decor create a harmonious environment that is calming and relaxing. 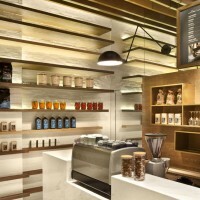 The main concept for the new interior, “blurring thresholds”, is amongst others translated in a custom made ceiling installation of lamellas, which looks like a burst of sun rays from deep within the store. The lamellas continue onto the walls to create shelves for merchandises. 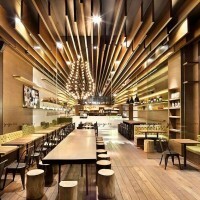 A large chandelier adorned with pingpong ball sized lightbulbs makes for an iconic feature that customers will be sure to remember. 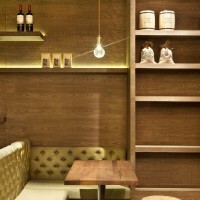 In the evening, the space takes on a lounge atmosphere, with dimmed lighting and soft jazz music. The outdoor floor panels continue into the interior and transition into sleek marble floors. The soul of Gaga lies for a great part in the food it serves and sells. 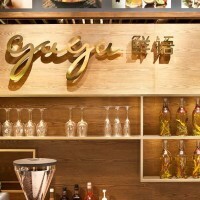 Putting more emphasis on merchandising, wall shelves spanning the length of the store are filled with products, surrounding the customers in the food culture of Gaga. 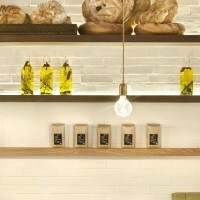 Customers can find top quality ingredients of which some are used in Gaga’s own kitchen. 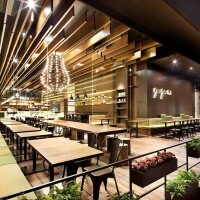 The specific merchandising concept ‘from our kitchen to yours’ promotes Gaga’s standards for quality ingredients and makes customers feel as if they are inside Gaga’s own private pantry. 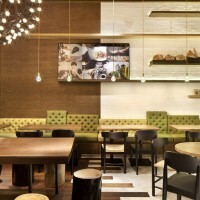 Gaga’s care for quality is also visible in other details; from individually customized tableware to decorative pieces. No two items are alike, and each item is selected with the greatest care. A flexible seating scheme was created to enable Gaga to handle high capacity while maintaining a homely and cosy atmosphere. 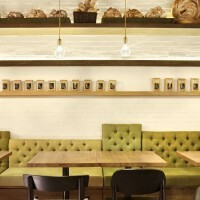 Plush sofa benches line one side of the café, extending all the way to the outdoor space. Floating seats in the middle of the space can be combined in different ways, to cater to parties of different sizes. Starting from a deep understanding of the brand, the design highlights and secures Gaga’s unique brand image and attitude. Gaga’s consumer will surely feel at home in the new space, and will be surprised to see that Gaga’s attention for detail, care for products and high quality taste has been taken to the next level by COORDINATION ASIA.